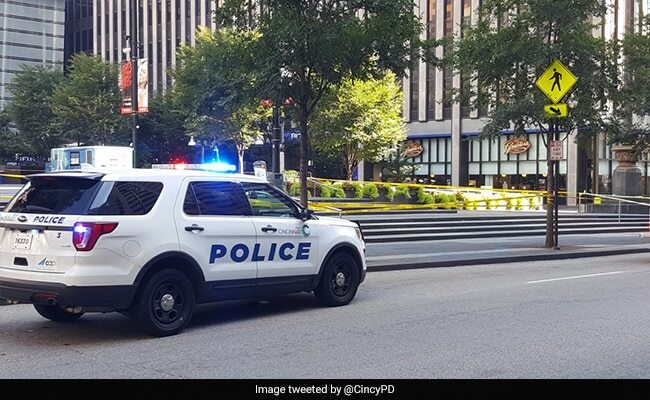 Cincinnati Police Chief Eliot Isaac said the shooter began firing inside a loading dock at the Fifth Third Bank near Fountain Square. He then entered the lobby where he exchanged fire with police officers, Isaac told a news conference. A gunman opened fire inside a bank in downtown Cincinnati on Thursday morning, killing at least three people and wounding others before being shot and killed by police, authorities said. Those killed and wounded by the gunman "appear to be innocent victims," Cincinnati Mayor John Cranley told reporters, adding that police officers were at the scene "within seconds." A city councilman, P.G. Sittenfeld, said the gunman's motive was unclear. "What a sick, tragic way for this day to begin. The scourge of gun violence leaves only loss," Sittenfeld wrote on Twitter. Witnesses said more than a dozen shots were fired, according to the Cincinnati Enquirer. One onlooker, Leonard Cain, told the newspaper he had been about to enter the bank when someone warned him about the shooting. Cain said he then saw a woman also walking into the bank, and that people tried to get her attention, but she was wearing headphones and did not hear them. "She walked in the door and he shot her," Cain told The Enquirer, adding that he heard up to 15 shots fired. The Enquirer said some customers were hiding inside a bathroom at the bank, and that one gunshot victim was found inside a nearby ice cream shop. Citing radio traffic, the newspaper said no officers were hurt. "I looked behind me and saw the guy - he shot and then he shot again. After that I started running," he told the Enquirer. Four shooting victims were taken to the trauma center at University of Cincinnati Medical Center, a police spokeswoman said. She said she did not know their condition. U.S. Senator Rob Portman said he and his staff were following the situation closely. "If you're downtown, please follow first responder instructions for the safety of everyone involved," Portman said in a statement.